Wild Elephant Valley, Yunnan, China. A sweet view of this very young calf, and it would be even better if the mother's head wasn't cut off right through the centre. I like how the calf is clinging to her side for reassurance in the water. The main subject is the baby, so I actually don't mind the mother's head being cut off. Having said that, I would probably crop it tighter to make it look like it's supposed to be all about the baby. I love the scene you captured here. I think the image is beautifully designed. Brilliant, in fact. Actually I do not think the bigger one is the baby's mother. There was an elephant family playing in the water, but I failed to capture satisfactory picture of more members. Composition is pretty subjective in the end, but I have to agree with Ron Day - brilliant composition! 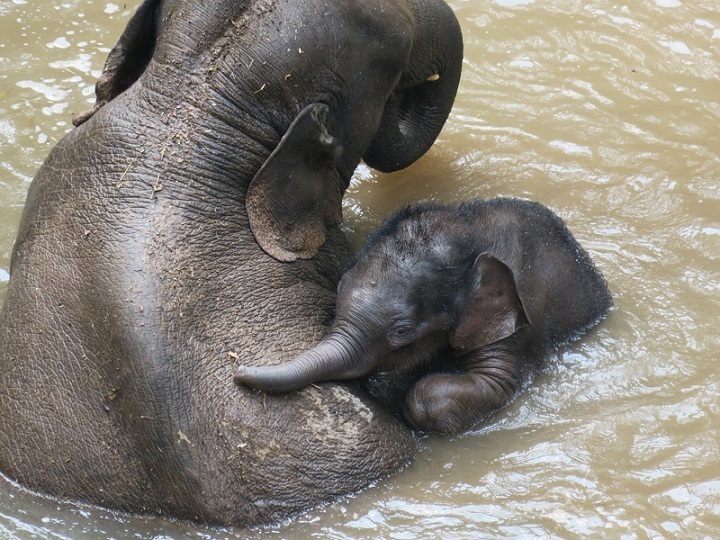 The photo really demonstrates the vulnerability of the little elephant snuggling up to the larger adult. This is just charming! you should not be embarrassed-as you can see , there are many ideas about the composition. It is very subjective. I like this the way it is because of tow they are curled around each other-a sort of yin yang effect. Yes, another time, maybe more of the adult'd head, but this works for me. I hope you will post more work soon!